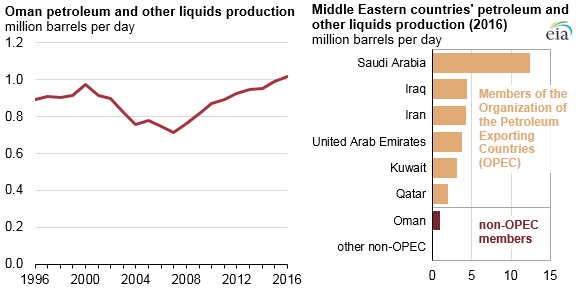 Note: Other non-OPEC Middle East includes Yemen, Bahrain, Syria, Israel, and Jordan. Oman set a new record with annual total oil production in 2016 exceeding 1 million barrels per day (b/d). Oman’s petroleum and other liquids production ranks seventh among the Middle Eastern countries. Oman is the largest oil producer in the Middle East that is not a member of the Organization of the Petroleum Exporting Countries (OPEC). Like many countries in the Middle East, Oman is highly reliant on its hydrocarbons sector. The Oman Ministry of Finance stated that finances have been severely affected by the decline in oil prices since mid-2014. In 2016, Oman's oil and natural gas revenues were 67% lower than in 2014, despite achieving record production. Oil revenue accounted for 27% of Oman’s gross domestic product (GDP) in 2016, a decrease from 34% of GDP in 2015 and 46% in 2014. Before setting the country's oil production record in 2016, Oman’s annual petroleum and other liquids production had peaked at 972,000 b/d in 2000 and dropped to 715,000 b/d in 2007. Since then, Oman’s total oil production has risen because of increased adoption of enhanced oil recovery (EOR) techniques and recent discoveries of oil. Oman was on track to maintain this production level in 2017, but as part of an agreement with OPEC member countries, Oman reduced production to approximately 970,000 b/d in early 2017. Almost all of Oman’s oil production is exported, mainly to Asian markets. In 2016, Oman exported 912,500 b/d of crude oil and condensate, its highest level since 1999. Virtually all of the country’s crude oil exports in 2016 went to countries in Asia, with 78% going to China. More information about Oman's energy sector is available in EIA's Oman Country Analysis Brief.